Special Guest post from Jess P! – Boil about 5/6 small to medium size potatoes for about a half hour or until they are soft and you can poke them easily with a fork. You can peel them first or just let the ricer do the work. – When they are still boiling hot (temperature is important here) press through a potato ricer (I’m pretty much banking on this tool being essential to making the gnocchi fluffy). Rice the potatoes directly onto a baking sheet and cool evenly before proceeding. – Then, in a big bowl, mix a un-heaping cup of flour and about half of the potatoes. – Add the beaten egg with some salt and two shakes of nutmeg and mix in by hand, adding the potatoes until the potato-flour ratio feels right. 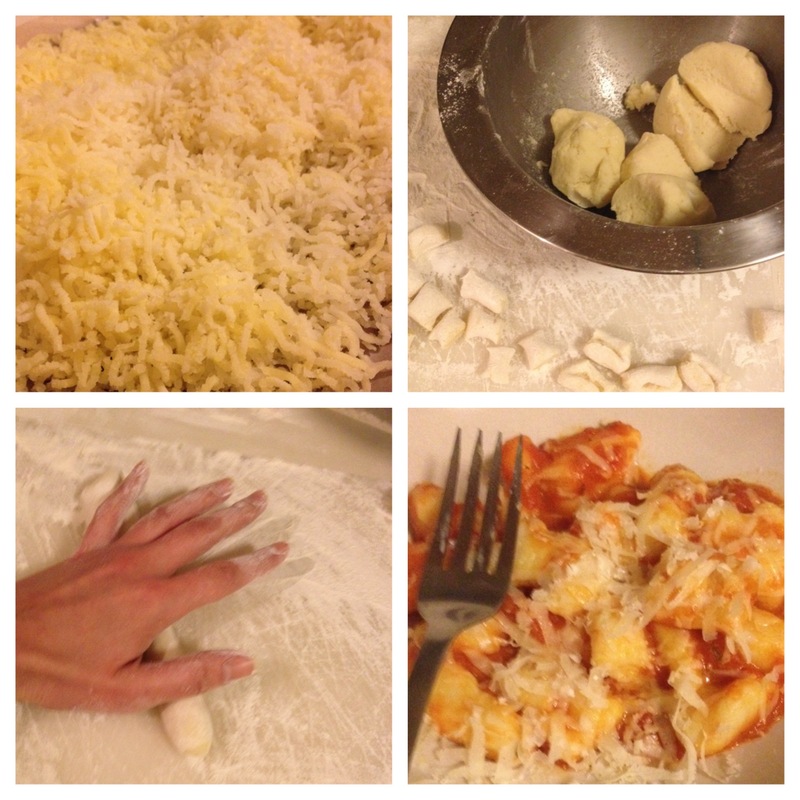 You want to use as little flour as possible since this will weigh the gnocchi down. – Knead for about 4 minutes by hand (but less kneading is better). I have not had to add additional flour at this step. The dough should be only slightly sticky at this point. – Divide into sections and roll on a extremely lightly floured surface. I barely need to use any flour at this point. Cut into 3/4 – 1″ bits. – Lay out on wax paper or a dish towel and then place into salted, boiling water in batches until they float to the top of the water. Strain to remove.